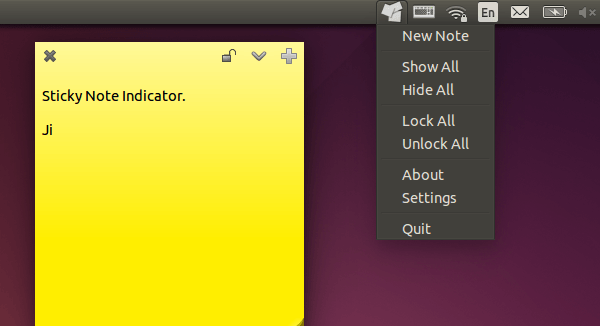 Ubuntu has an open-source sticky notes app called indicator-stickynotes. Just like Google Keep and Windows’ Sticky Notes, it allows you to jot down thoughts, lists, and reminders on desktop. Indicator-stickynotes is meant for Ubuntu’s Unity interface. It has also been tested on the GNOME Shell, XFCE/Xubuntu, KDE/Kubuntu, MATE/Mint, and Cinnamon/Mint interfaces, but support for these platforms is not guaranteed. The program has been made into the developer’s PPA, available for Ubuntu 14.10, Ubuntu 14.04, Ubuntu 13.10, Ubuntu 12.04 and their derivatives such as Linux Mint, Elementary OS Luna. Once downloaded, double-click on the package to open it with Ubuntu Software Center and click install the program. Thanks for useful post, I followed the steps and installed it on Ubuntu 14.04. However, unfortunately, it always crashes with the error saying ‘Sorry, Ubuntu 14.04 has experienced an internal error’. ‘indicator-stinotes.py crashed with UnicodeDecodeError in decode(): ‘utf-8′ coded can’t decode byte 0xae in position 5:invalid start byte’. I tried adding the updates using ‘sudo apt-get update’, did not seem to help. Any suggestions/comment is appreciable.